You may have read about Wheels for Wellbeing in today's feature on The Guardian website about why some disabled people cycle. Here's the first of two posts about this locally based nationally recognised cycling group. Brixton-based Wheels for Wellbeing has been celebrating 10 years of helping disabled people to stay active. 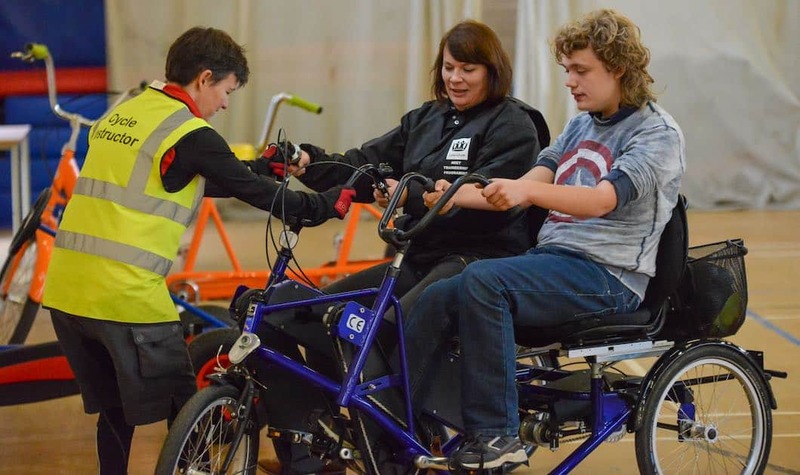 The charity runs inclusive cycling sessions five days a week at venues in South London with its unique fleet of trikes, wheelchair attachments, tandems, handcycles, and specially adapted cycles. Participants and supporters enjoyed a week of parties. This was followed by Wheels for Wellbeing's first 'Beyond the Bicycle' conference exploring how cycling can continue to transform the lives of disabled participants, and how disabled cyclists can now help transform cycling for all. Picture from Wheels for Wellbeing. The driving force for the creation of Wheels for Wellbeing was the frustrations of the everyday experience of disabled people in Lambeth, together with a pioneering team who wanted to spread the benefits of cycling for all. If you'd like to find out more, or can help with campaigning or fundraising to help more disabled people of all ages discover the love of cycling, visit WfW's website or find them on Twitter @wfwnews.